From Burlingame's New England Lobster (see post HERE) to Redwood City's Old Port Lobster Shack (see post HERE), I thought I've almost conquered all the lobster rolls in the Bay Area, but up popped Billy's Boston Chowder House. The casual decor and atmosphere reminds me of The Old Port Lobster shack. Its called Billy's Boston Chowder House so I feel compelled to get some chowder, but I usually get clam chowder anyways. They offer a trio, which includes New England clam chowder, Manhattan chowder, and lobster bisque. It's perfect for people like me who can't decide on just one and need to taste all of them. I've never been a fan of Manhattan chowder, but this one is ok. The New England clam chowder is rich and buttery with a decent amount of clams. The lobster bisque is probably the best of the three, but I still prefer the lobster and corn bisque at New England Lobster in Burlingame. You can never go wrong with fried calamari because its chewy and crispy. Here, its a little too dry and the batter could use some seasoning. Finding all these Mexican dessert spots makes me wonder why can't I find any in the city? Los Manguitos is a welcome sight on Middlefield Road, where its densely populated with taquerias and taco trucks. While the parking and driving situation to get here is not pleasant on the weekends, I think this place is worth the hassle! The interior is sparse and colorful and very similar to most of the Mexican ice cream shops I've visited in the Bay Area - United Paleteria in San Jose (see post HERE), Nieves Cinco de Mayo (see post HERE). Out of all of them, I think this is probably the best I've had so far. 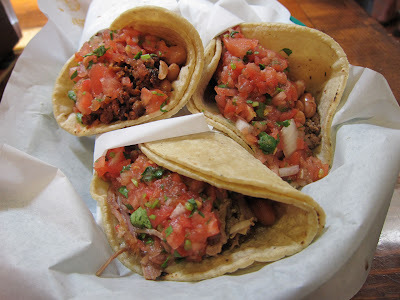 Los Manguitos has mangonadas as well as tostilocos. The menu of popsicle (paletas) flavors! The case of delicious and gorgeously crafted popsicles. Check out the one with the sliced kiwi! Although this fresca de leche (strawberry & milk) popsicle doesn't look like anything special, its amazing! Possibly the best popsicle I've ever tasted. The strawberry doesn't just taste like a strawberry, it tastes like its made with the ripest, freshest, juiciest strawberries. I only wished that I saved some room in my stomach to try more flavors! I'll definitely be back to check out more of these $2 frozen fruity treats. 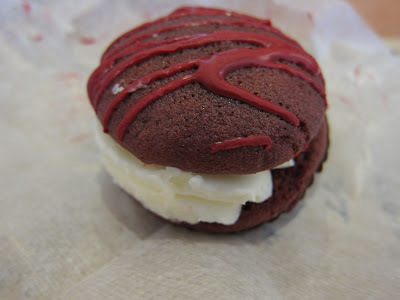 The fresca con creme (strawberries with cream) is also another popular sweet here. I don't recall seeing this at any of the other ice cream spots so I had to try it out. The taste is similar to a strawberry parfait, it even has granola sprinkled on it. The cream is a little sweeter than normal yogurt. Layers of fresh strawberries and cream are alternated and then topped with coconut, raisins, and granola for some added texture. Its good, but I'd go back for the popsicles, they are a must eat here. 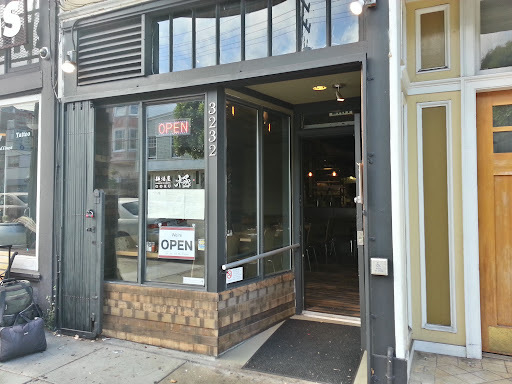 San Francisco's choices of ramen spots are medicore at best. For any decent bowl of ramen I usually have to head out to the South Bay or to the Peninsula, but Ramen Izakaya Goku has to be one of the better bowls of ramen I've had in the city so far. Fun fact: Goku supposed means "hella"in Japanese, which seems to be quite fitting since we are in the Bay Area. 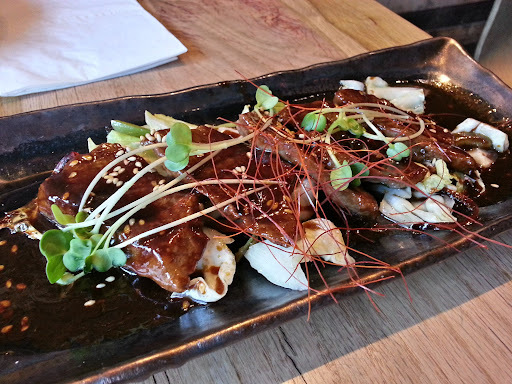 While it also calls itself an izakaya, it is far from that. It does offer a couple small plates and appetizers on the menu, but I'd categorize this more of a ramen spot than an izakaya. 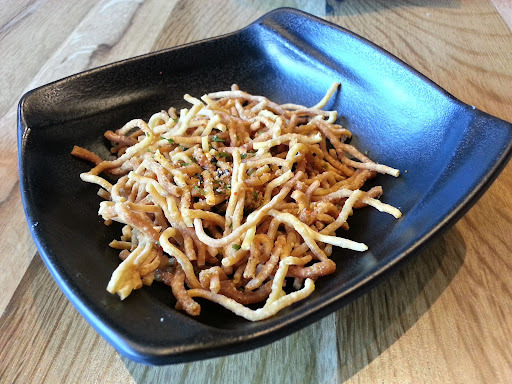 A bowl of seasoned crispy noodles are given when sitting down for munching while you wait. It reminds me of eating ramen straight out of the package when I was a kid. The bbq kobe beef ribs seem to be popular here, but while the meat is very tender some parts of the meat are a bit too chewy and hard to eat. Also, the sauce is a little too salty for my taste. The wasabi fries are pretty much exactly what they sound like. 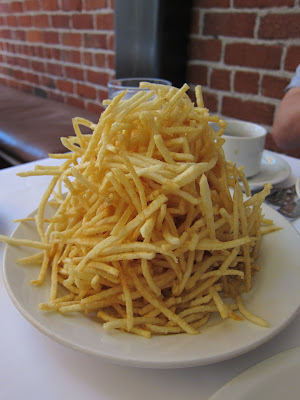 The fries are similar to McDonald's fries, but more crispy and sprinkled with wasabi powder. It doesn't have the surprising punch that normal wasabi has, but it does have a nice kick. The ramen comes with a choice of spicy option: cool, mild, medium, extra spicy, and goku (hella) spicy. The chasu tonkotsu ramen comes with the largest slice of chasu I have ever seen in ramen. It reminds of a thick piece of steak. Each bowl comes with a boiled egg, bean sprouts, Kikurage mushrooms, bamboo shoots, and green onions. The noodles are a little thicker than normal ramen noodles and a little on the mushy end. I prefer my noodles a little more chewy and al dente. The broth, however, is quite delicious. Rich, fatty, salty, and everything you expect in good ramen, except without the MSG. 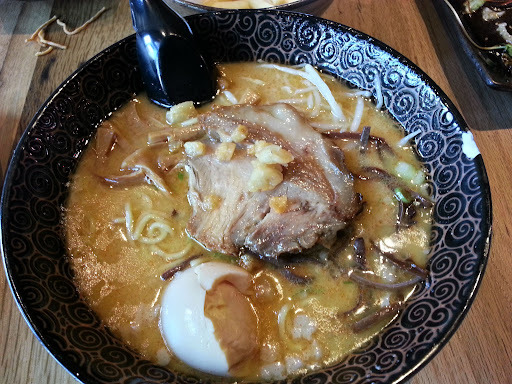 The kakuni tonkotsu ramen mimics the same hearty, fatty, broth that the tonkotsu has. 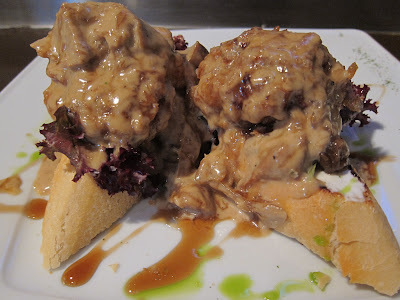 Glorious globs of fat float around this delicious bowl. 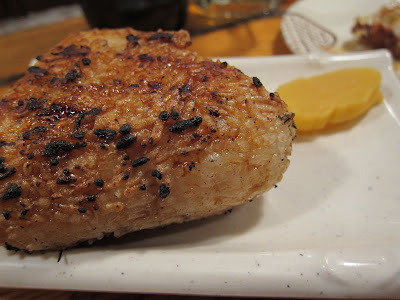 The piece of Kakuni braised pork is tender and juicy, but unusually large. Still the biggest gripe is the soft noodles, but hopefully next time I can just ask for firmer noodles. 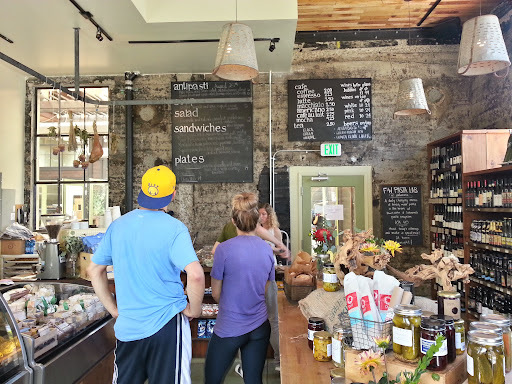 Salumeria is both a deli and a meat shop. 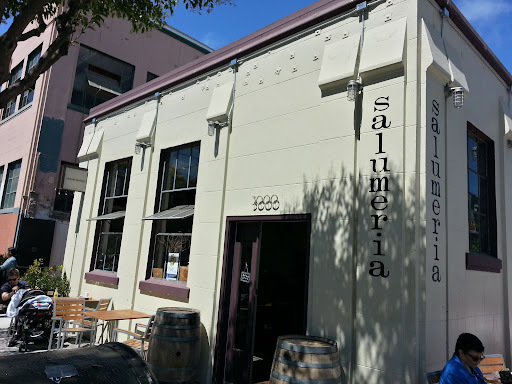 With outside seating, its a great place to enjoy a sunny San Francisco day. Lots of deliciousness to be had here, from cheese selections to jars of delicious pickles. 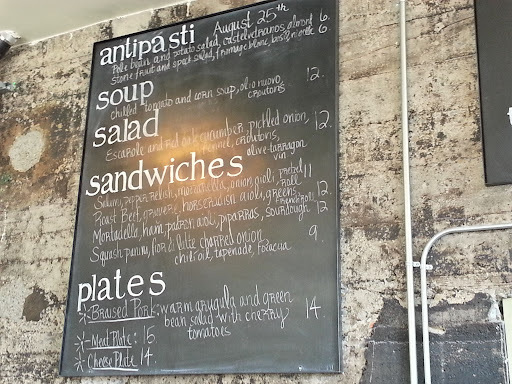 The sandwiches and menu items change here, but its a meat and cheese shop so anything with either are the best bet. Pretzel rolls seem to be the things these days. Even Wendy's has taken a stab at the trend. The salumi , pepper relish, mortadella, and onion aioli in a pretzel roll just shows how quality the meat and cheeses are here. Each sliced meat is sliced super thin and is full of flavor. Its been a while since I've had meat sliced so thin and perfectly. 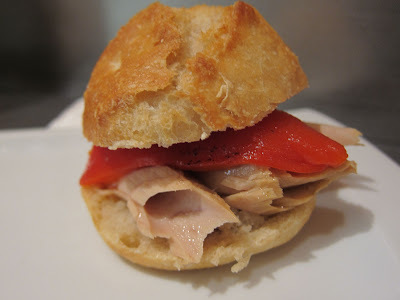 It reminds me a little of the sandwiches at Molinari's in North Beach (see post HERE), which I think are awesome. The pretzel roll here is just the kicker on this amazing sandwich. Chewy with just a hint of saltiness. Perfection. I rarely get meat platter these days, but I'm so glad I did here. The sliced meats are just amazing here. 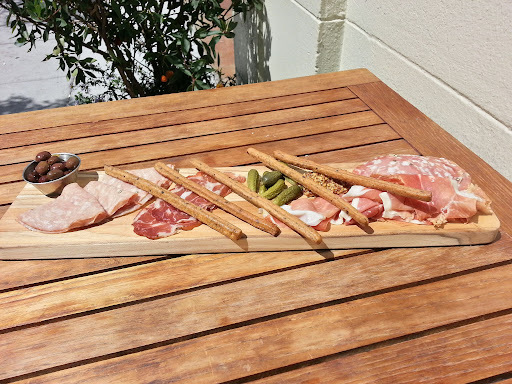 Each sliced meat is so flavorful and fatty, it sets itself apart from just any ordinary cured meats platter. Three times a charm! Finally after two failed attempts to locate Sugar & Spun at the SOMA street park, I got to taste this adult version of cotton candy. 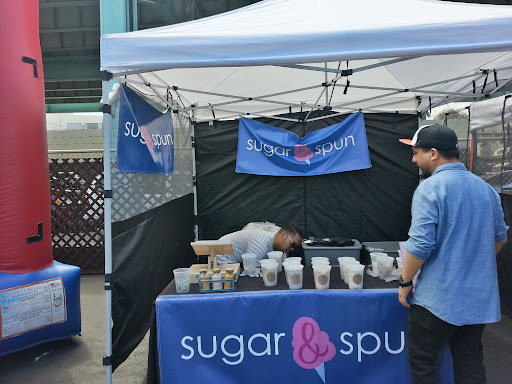 Sugar & Spun puts their creative take on cotton candy, which I have to say is kinda genius. From Four Barrel coffee flavor to cheesecake, they've reinvented a childhood sweet snack. They don't make the actual cotton candy on the spot (which I think would have been kinda cool to see). Instead they come in premade large containers. Today there were four choices to choose from: cookies & cream, four barrel coffee, salted chocolate peanut butter, and polyvron. With a couple samples of salted chocolate peanut butter, I have to say I was in awe by how delicious and true to flavor these cotton candy treats were. Cookies and Cream was fluffy and resembled a very cookie and cream flavor. Just upon opening the four barrel coffee flavored cotton candy, I could smell the strong coffee flavor. It tastes just like coffee. Love the totally fun take on cotton candy. 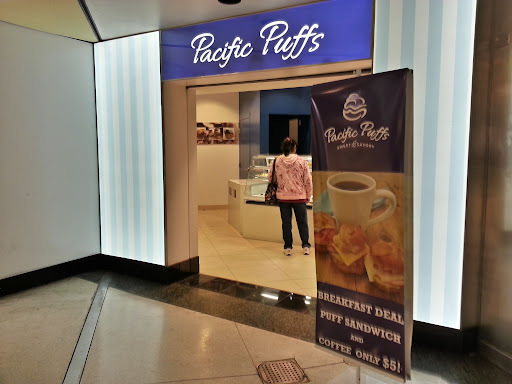 I was surprised to see Pacific Puffs making a home in the Powell St station in a location that has been somewhat unlucky with previous tenants. 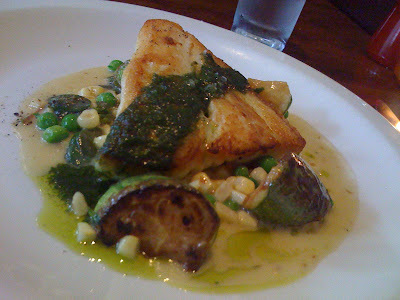 The menu here offers a savory goodies, which its original Marina location does not. 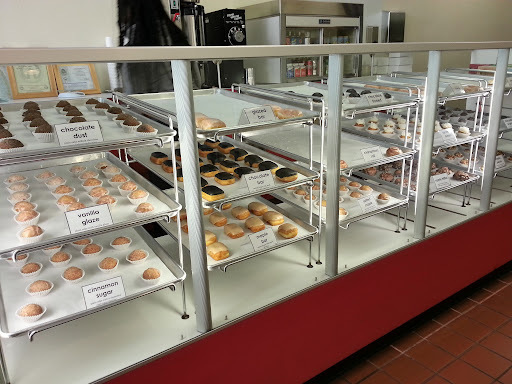 The menu offers breakfast (served all day), savory, and sweet puff options. 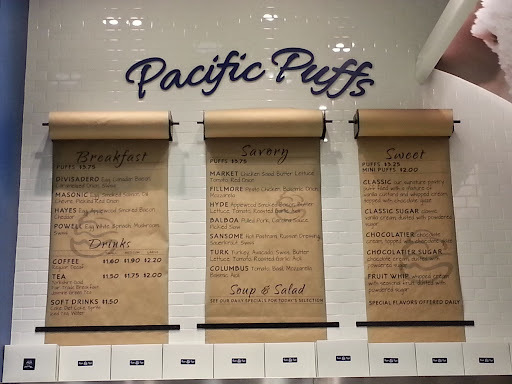 Pacific Puffs offers an interesting twist to the puffs with a savory sandwich options made with the cream puff shells. The sizes are more like a snack size. The sansome is made with slices of pastrami, Swiss, and sauerkraut. 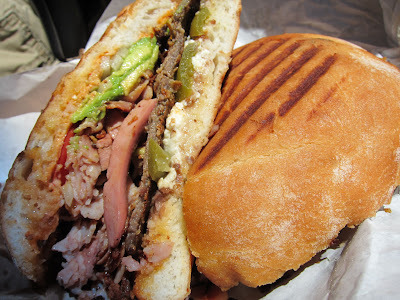 The meat is juicy and the sandwich has good flavor, but the puff shell does not work well with this sandwich. 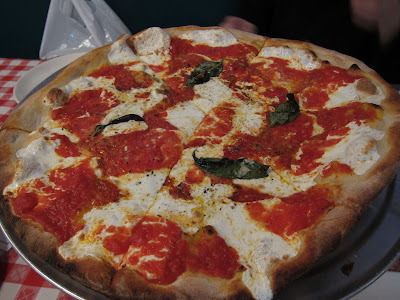 The outside ends up being too soggy due to the hot slices of meat. With the savory items comes some breakfast sandwiches. The masonic sort of reminds me of a fancy egg McMuffin with its premade egg, dill sauce, and a tiny slice of smoked salmon. Tiny, but surprisingly delicious. Also, the shell held up a little better in this sandwich than the pastrami one. 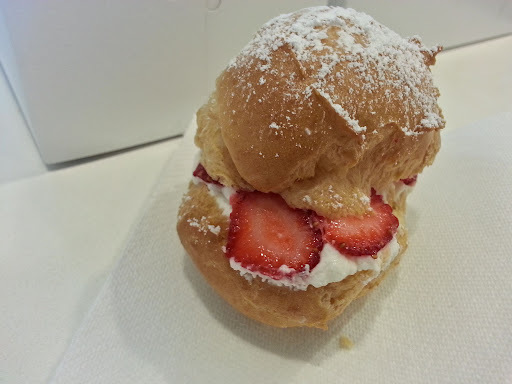 The strawberry cream puff was my favorite in this haul. Fresh strawberries and cream with a light and airy shell, whats not to love. The cream puffs come in a regular size as well as a mini size. The mini size are about two bites, but for an extra dollar and some change you can get the regular size. The standards seem to be the regular cream, chocolate covered with vanilla cream, chocolate covered with chocolate cream, and regular chocolate cream. 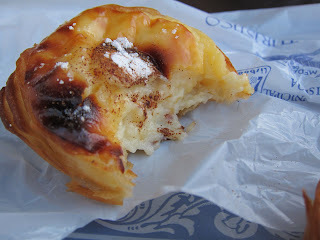 The cream is a little more on the whipped cream flavor versus some have a little more vanilla taste (Beard Papa). I've been promising to post this a very long time ago - about a year ago right after Craftsman and Wolves opened. After having their Rebel Within (see post HERE), I was so amazed by their creation that I vowed to make one of my own. Anyone that knows me knows that I rarely conjure up recipes unless its super special. I think this one is and with a little work, you can shock and awe others too. The main ingredients of my version of the Rebel Within are: eggs, milk, Bisquick, butter, garlic powder, shredded cheddar. Supplies include: large mixing bowl, measuring cup, brush, muffin pan. Preheat oven to 450 degrees. In a large mixing bowl, combine the Bisquick, milk, cheddar cheese, butter and garlic powder. Mix well. It should be somewhat chunky in texture. FYI - This is actually similar to the Red Lobster biscuits so its not actual a bacon biscuit like Rebel Within's version. 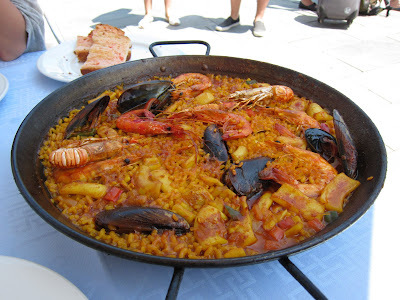 Although, you could probably add some bacon bits or fry up some bacon and add it to this. Fill the muffin pan with the mixture, making almost nest like structures. You can use your fingers to make about one inch holes and then lightly press the sides of the mixture against the pan. Make sure you don't make it so thick, otherwise the batter won't cook thoroughly. Leave about a quarter of the mixture in the bowl for their tops. In a boiling pot of water, boil the eggs for 3 minutes. If you can sous vide the egg that would probably work best, but I'm not that fancy and this works as well. Ultimately, you want a jiggly soft poached egg. I'd suggest bowling a couple extra in case of breakage or mess ups. Now the hard part - the peeling of the shell. Be VERY careful peeling the shell off the egg. The egg will be very soft and delicate. Handle with care! I found putting it into a spoon and peeling a little, then rolling it a little, then peeling, repeat till done. Place each egg very gently into each of the holes you created. I suggest putting the egg with the pointy side down. Then cover very lightly with the rest of the batter. Pinch the batter around the edges slightly and clean up the excess so you end up with nicely formed muffins. Put this in the oven and bake for 15-17 min. The tops should be golden brown. You can stick a toothpick on the edge of the sides to see if the batter has been cooked through. In a small bowl melt some butter and mix in some garlic powder. After taking it out of the oven, brush the tops with the garlic butter. Let the muffins cool for about five minutes before taking the muffins out. They should pop right out. Then cut them open and stare at how awesome your creation is. One thing to note - as time passes, the egg does cook in the muffin so to enjoy the runnyness of the egg, you have to probably eat it within the hour. Enjoy! 1). Preheat oven to 450F. 2). Mix Bisquick, milk, shredded cheddar cheese in a large mixing bowl until a soft dough forms. small hole (about an inch wide). Leave about 1/4 of the mixture in the bowl. 4). In a boiling pot of water, boil eggs for 3 minutes. 6). Carefully place eggs pointy side down in the holes. 7). Use the rest of the batter to cover eggs. Slightly pinch the outside edges. the edge. No batter should stick to it. in garlic powder. Brush the garlic butter mixture on the muffin tops. 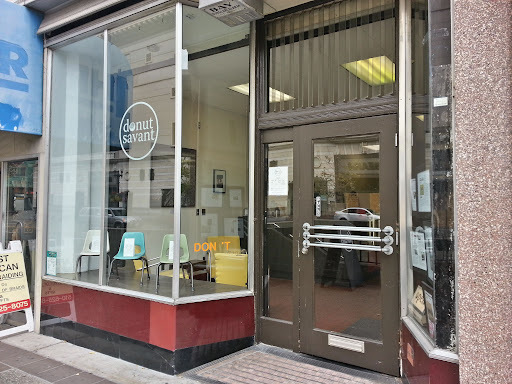 Donut Savant has been open just over a year and I finally got the chance to check it out. This cute little donut shop churns out flavor from the standard (vanilla, chocolate bar, etc) and the more unique (maple bacon, oreo, etc). Although the donuts are the obvious selling point at this shop, the coffee is amazing! These small donut bites are about $1 and they are just the perfect size to try a handful of flavors. The apple fritter is fluffy with pieces of apple. Its no Bob's SF version (see post HERE), but its mini size makes it perfect for when you want an apple fritter AND something else. The salted maple donut was probably my second favorite (after the maple pecan). Every donut here is fluffy on the inside. The mini sized donuts are just so cute, I can't stop raving about their size. The mini chocolate bar is no exception. The chocolate is thick, rich, and very chocolatey in flavor. The vanilla glaze donuts are slightly bigger than a regular donut hole. These cake donuts are covered with vanilla glaze. For some reason, I thought it would be more of a regular glaze, but this heavy layer of vanilla frosting was a little too sweet for me. The maple pecan was a last minute decision, but it ended up being one of the favorites of the bunch. With its nutty, toasted pecans and the sweet maple frosting, its a pairing that just worked. The s'more donut is so cute with its giant marshmallow slightly toasted on top of a chocolate frosting donut.